Apex Sciences has listened to our customers! Though our competitors have $15 handling fees plus high shipping costs, Apex is not going along. 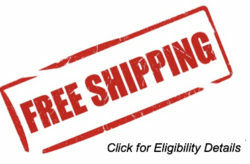 Apex has never had handling fees and now offers free UPS Ground Shipping in the continental United States. This offer applies to orders placed through Apex Sciences for vacuum hardware, vacuum valves and rotary seal feedthroughs. Electrical feedthroughs are not included in this program. Orders less than $150 excluding shipping and taxes. Orders where shipping is not UPS Ground. This includes freight, and express shipping orders. Orders placed through other companies represented by Schoonover Inc.
Apex Sciences reserves the right to end this program at any time.